The customer implemented a successful business model that has seen more stores open year after year. As a result, the distribution centre needed to re-organise the centre due to the increase in demand. The leading fashion retailer group employed a leading warehouse management solutions company to review the process and make relevant changes. BenchMaster worked with the warehouse management company to provide a number of workbenches for different stages of the process. Stage one was for packing orders, stage two for returns and re-work and stage three for receiving stock. Plans were followed efficiently to ensure the retailer’s key objectives were met. 54 x AB1575L – 1500mm long x 750mm deep x 900mm 20mm laminate top medium duty workbench with a blue frame, laminate upper shelf, laminate lower shelf and all metal levelling feet. 6 x AB2012L – 2200mm long x 750mm deep x 720mm 20mm laminate top medium duty workbench with all metal levelling feet. 24 x AB2075L – 2200mm long x 750mm deep x 720mm 20mm laminate top medium duty workbench with all metal levelling feet. The retailer has grown over a number of years across the UK and Europe. This meant that the distribution demand continued to increase. 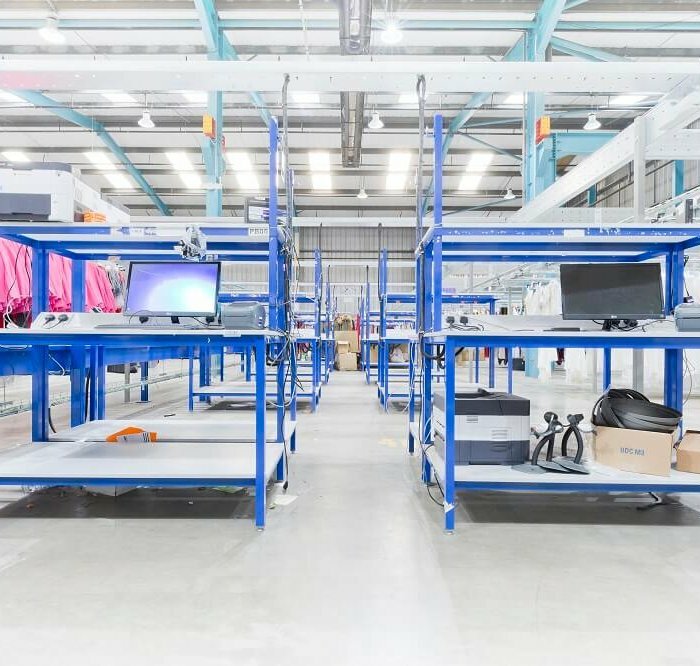 As a result the distribution centre required an overall plan, which included purchasing new workbenches. The workbenches have been successful and due to ongoing demand more workbenches are being ordered every year. 12 more of the packing station have been ordered in June 2018.